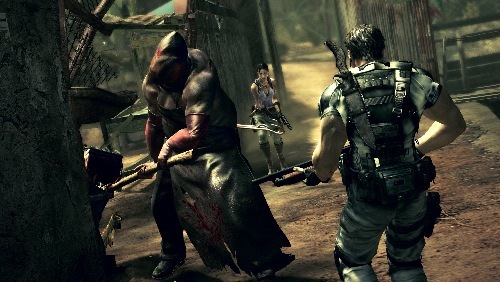 Resident Evil 5 was an early co-op hit this year. As you'd expect for a title so popular, quite a bit of extra content is headed your way soon. The PS3-exclusive "Alternative Edition" is coming soon, and will include all the DLC listed below, plus compatibility with Sony's forthcoming motion controlling doohickey. (Pretty sure that won't be the final name.) Xbox 360 owners and those who already own RE5 for PS3 can also download this content. Includes the Lost in Nightmares episode, EX figures, and two characters for The Mercenaries Reunion. Priced: ¥500/400MSP. Includes two costumes, EX figures, and two characters for The Mercenaries Reunion. Priced: ¥200/160MSP. Includes the unannounced new episode, EX figures, and two The Mercenaries Reunion characters. Priced: ¥500/400MSP. A video preview of the "Lost in Nightmares" episode is available for download to your Xbox 360 here. The Japanese release date for the Alternative Edition is February 18, but there's no word on a timeline for other regions. Update: Capcom has released individual dates per region and platform. The game will be out in disc format, titled the "Gold Edition" on both platforms. While the PS3 version will have all contents on a blu-ray disc, the 360 version will simply be bundled with a token to download the content. Page created in 0.2635 seconds.